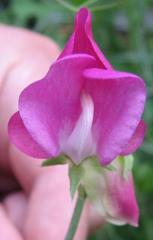 I am currently studying the genetic basis of the 'hooded' floral mutant in sweet pea (Lathyrus odoratus). 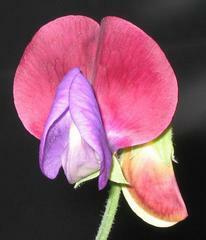 Flowers of hooded sweet peas possess several shape and colour traits that distinguish them from wild-type flowers. The standard of hooded sweet peas is cupped and hood-shaped, rather than erect and banner-like. The hooded standard petal is much smaller than the wild-type standard petal, and is often more comparable in size to wing petals. Strongly hooded sweet peas often posses two deep, symmetrical lobes on the edges of the standard petal. Wild-type standard petals are not lobed.